Many years of war devastated, Angola was to save the prehistoric road which are important for science. For the first time, after a period of peace, the scientists found dinosaur fossils in southwestern Africa. The fossil was found in a variety of State scientists engaged in expeditions of excavation there. Only a bone in the leg in the front. Characteristics, fossil species of dinosaur believed to you have originated from an unknown or new species. The scientists named it Angolatitan Adamastor. Angolatitan mean giant from Angola. Adamastor taken from the sea giant figure in the myth of Portuguese sailors. According to experts, including the largest dinosaur among other types. Dr. Octavio Mateus of Unversidade Nova de Lisboa Portugal found Angolatitan Adamastor in 2005. Appointment and research since it began. 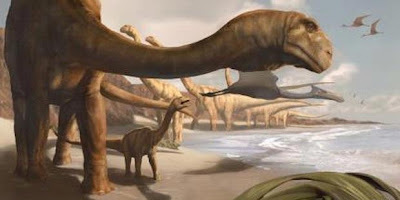 dinosaur fossils found at the site in 90 million years ago ocean. Nearby, fish fossils and shark teeth. "Maybe this dinosaur was dragged into the sea and torn apart by ancient sharks," the scientists estimated. This finding is the result of the first paleontological expeditions since 1960. Angola is one of the countries with a prolonged war. The war broke out in the 1960s, followed by civil war after winning independence from Portugal in 1975. The war ended in 2002 after the security forces managed to crush the rebel leader Jonas Savimbi. "We are not afraid of the mines, we are not afraid to mention of the conditions that are problematic in the past," said Dr. Mateus. (Alex Pangestu / National Geographic Indonesia).